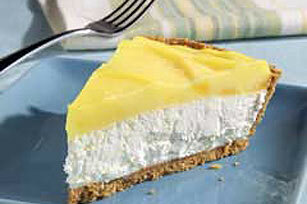 Crushed pineapple and lemon-flavor pudding mix team up to make a scrumptious topping for this easy no-bake cheesecake pie. Beat cream cheese and sugar in large bowl with whisk until well blended. Stir in COOL WHIP and half the pineapple. Beat pudding mix and milk in medium bowl with whisk 2 min. (Mixture will be thick.) Stir in remaining pineapple. Spoon over pie. Refrigerate several hours or until chilled. Save 90 calories and 8 grams of fat per serving by preparing with PHILADELPHIA Neufchatel Cheese, COOL WHIP LITE Whipped Topping, a ready-to-use reduced-fat graham cracker crumb crust, fat-free milk and JELL-O Vanilla Flavor Sugar Free Fat Free Instant Pudding.